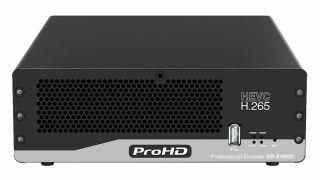 The What: JVC Professional Video, a division of JVCKENWOOD USA Corporation, has launched the ProHD BR-EN900 encoder designed for studio and remote production, ENG, live streaming from sports venues, and point-to-point HD video contribution. The What Else: Powered by an all-hardware compression chip, the portable BR-EN900 provides broadcast-quality HEVC (H.265) encoding up to 1080p60 with 10-bit 4:2:2 sampling. Dual encoding capabilities allow simultaneous H.265 and H.264 streaming to different destinations, such as hardware decoders and CDNs. The HEVC codec reduces bandwidth requirements and the associated costs when streaming over cellular, satellite, and broadband networks. The Bottom Line: Designed for nearly any video environment, the BR-EN900 includes 3G-SDI, DVI, HDMI, and composite inputs, plus support for analog and digital audio (embedded and discrete). The compact encoder can be integrated into mobile production vehicles and transport cases. It also features Zixi error correction technology, which provides error-free video delivery over the internet and can tolerate network congestion, high jitter, and packet loss. JVC will demonstrate the new encoder at the 2019 NAB Show (booth C4415). The BR-EN900 has an MSRP of $5,990 and will ship in June.